I came back from winter break to a very cold city and a schedule full of theatre. What was I thinking when I lined up all these back-to-back shows?? Why can’t I feel my toes? Gripe gripe gripe. Welcome to January. I am excited to see theatre nonetheless. I admit it. It’s great that theatre takes place in a heated indoor space and sometimes my friends were in that space too. I leave each show shocked to be cold again (why? why?) and particularly open emotionally. I think my break from theatre, coupled with reading about the attacks in Paris, makes me feel more awake than usual. Which is not my favorite state in a city that constantly assaults my senses. After each show this week, on the train home, I felt especially vulnerable. That sensation stayed with me for a long time after two shows in particular – O JARDIM by Companhia Hiato/Leonardo Moreira from Brazil, which I saw last Wednesday, and CINEASTAS by Mariano Pensotti from Argentina, which I saw on Friday. O JARDIM features three stories told in rotation about memory, regret, and loss. Each story is told to one section of the audience at a time, after which the actors shift places to repeat the scene to a new section. Depending on where you are seated, you get a different chronology. The play opens with a tableau. Two men–one young, one old–stand in the same sweater vest in front of five women seated on cardboard boxes. Oh yeah. Cardboard boxes! The entire back wall is cardboard boxes stacked to the ceiling, and there are boxes all over the ground in various shapes and sizes. They look daunting, geometric, ordinary, home-grown. Music grows and the actresses go about constructing a complex assemblage of boxes; eventually they divide the stage into three sections and take their place in front of the three audience banks. The music goes out. We are plunged into our respective story lines. At first I want to see the other stories and subtitles. But I can’t. I trust that that’s on purpose and pay attention to the two actresses speaking very rapidly in front of me. Remember that couple fighting? Hi. They are in front of me now. I’m expecting lover’s arguments and a kiss. But we start in silence. It is immediately clear she does not want to leave and he wants nothing more than for her to leave. He is packing up his stuff; she is there to give him an early birthday present. We learn that they lost their child – she calls him Aline, he calls him Junior. Balloons are released from a box and bump up against the light grid. She says, “A body has a hundred times more memory than the mind.” I realize it is 1938. They discuss what the happiest day of their life might have been. He says it was their wedding. They dance to a song they sing together. They kiss. It’s intense. Cling to each other. Almost stay. No. Let me go on, he says. (This breaks my heart even though it echoes many love scenes). She starts splitting up their photos. She tries to kiss him again and place his hands on her bare breasts, but he is immobile. She gives him a sweater vest for his birthday. She leaves. I realize we are always in the same house. Maria Amelia (Aline’s mom) and Maria Amelia’s sister throw an early birthday party for their demented father who is about to go into a home. Maria Amelia is pregnant, no husband. Her sister is an actress visiting from France. It is very difficult for them (and us) to see how their father won’t take off the sweater vest (the same one that was a gift in the previous scene). It smells awful, so they try to take it off him, but he tries to pull it down. It is only when the sister distracts him by dancing and jangling her bracelets that Maria Amelia can take off the sweater. The sister sings a song–it’s from the second scene, and the father tries to touch her breasts. I realize he never stopped loving the woman from the breakup scene. The boxes move again. The father sings the same song the couple danced to, and the woman from the breakup scene kisses him. I realize there are many things I would not remember from this play if they were not repeated, much in the same way that I remember anything at all if it’s repeated in an emotionally impactful context. Suddenly I’m sad about this song I’ve only heard twice. And when the woman kisses the old man I feel complete closure – they are together after all. Balloons go up! The men stand in their matching vest. The cast gets up close to the audience and shows us objects, urgently explaining what they are to them in English, almost shouting above the music that has grown louder. A balloon is popped. The show ends. I am incredibly nostalgic for something I don’t remember. I don’t feel like talking to anyone. The music is ringing in my head. And I put all of those emotions in my pocket and get up. I keep feeling like I’m forgetting something. I am feeling a bit more guarded on Friday. A bit. I’m looking forward to seeing Mariano Pensotti’s newest play, I’m pretty familiar with his past pieces. (I’ve written about him before here). 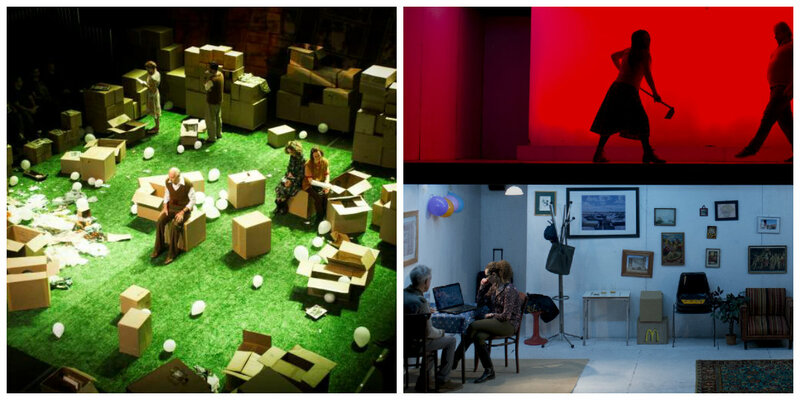 His play CINEASTAS follows four filmmakers and their films on a split screen stage (top and bottom). Pensotti does an excellent job of establishing the facts before the narratives start to gather pace and just roll. Each filmmaker’s story is narrated by one person speaking into a mike who follows the action in the same space as the protagonist we are following. Above or below each scene, the filmmaker’s own movie plays out, complete with dialogue and movement. The feeling of CINEASTAS is much like reading a novella and glancing up to watch a TV show at the same time. My brain switches gears and follows multiple storylines easily, though at times it becomes exhausting to keep up. Characters are established and we watch – at times absorbed, at others passive – as their lives and films unfurl before us. Storylines. Briefly. So briefly. We are in Buenos Aires, Argentina. Nadia, the indie filmmaker with writer’s block, is making a corny film about a “disappeared” father who magically returns to Argentina and re-establishes contact with his adult sons. But really she is thinking about her own disappeared father and wondering if he has been watching her, hidden, all these years. He has not. Gabriel is a successful workhorse who is dying. He has a beautiful young wife and daughter. He changes his highly-anticipated next film to be more and more like his life. His lead actor basically becomes him in his real and fictional lives. Gabriel gets fired from the film when it becomes too obscure, but he is just happy thinking about his real life captured on film. Mariela leaves her rich older husband and has an affair with a Russian man, Dimitri. Her documentaries deconstruct Russian music videos from the fall of the Soviet Union. They play out in pseudo-comedic fashion in bright colors, contrasting with her real-life issues She gets pregnant and moves to Russia to find Dimitri. You guessed it. He has another family. She ends up…well, that’s the end of the play, so I’ll save it. Lucas is an amateur filmmaker who works at McDonalds. He makes a thriller about a man who is kidnapped and made to wear a Ronald McDonald costume. Lucas’s film moves to the sidelines when he becomes successful working for The Man. But a violent turn of events involving a strike brings him back to his subversive film, and it ends with the protagonist unable to enter back into his life upon release. All of these stories are woven together; they interrupt each other seamlessly. The end of the play, which finds the stage completely bare and bathed in white, speeds these stories up – you can almost hear a voice going “switch!” “switch” – until we end up watching Mariela in her grandparents’ village of origin. We see happy, simple peasants undergoing a local ritual. Then Mariela realizes she is on a movie set. The cast stops acting and a huge dance party breaks out. Colors flash. Music pulses. Everything is fake. Everything is real. So then is theatre about allowing time, and our perception of time, to warp? I left CINEASTAS bleary eyed and realized this is how I feel when I walk out of a long movie. I was absorbed, overwhelmed, bored, then back to absorbed over the hour and a half. This multi-tasking made me tired after a while, and sometimes I just wanted everything to stop, but I’m also used to paying attention to multiple things at a time (hello New York and my iphone). CINEASTAS is like theatre coiled around film – time stops, we can stare at it, but then it bends and tilts and we stare at it harder as it moves and moves and moves. I left The Public to run to LaMama to catch Lucy Alibar’s Incoming! show Throw Me On The Burnpile and Light Me Up. As I speed walked and the feeling of warmth left my fingers and toes, I thought about how everything I was looking at in the East Village was simultaneously real and fake to me. I could see my own fictions and memories play out in front of me. That corner is where I stood helpless as my friend cried in the rain in 2008. That bar is where I celebrated my birthday in 2010. And now I’m running in the cold to Lucy’s show. I couldn’t stop watching my memories being created around me and think about how impossible it is to really regret any of them because without them, I wouldn’t be walking down the street right now. That’s cliché. I know. To be fair, both shows had a fair amount of cliché in them–it’s hard not to be cliché when examining memories from a distance. But both artists stepped surpassed the cliche and made me look right at the present moment. In particular, I was looking at the present moment swallowing the past again, and again, and again, and again. Sarah Rose Leonard is a dramaturg, director, and creative producer. She is the Literary Associate at Signature Theatre. She has been the Associate Agent at AO International and the Next Generation Fellow at The Martin E. Segal Theatre Center at the CUNY Graduate Center. Sarah has co-curated PRELUDE.14, curated/produced FEM, an annual event about femininity at JACK, and was the Creative Producer on DESORIENTACIÓN, a cross-cultural reading series in Chile. She has dramaturged plays by Eliza Bent, Guillermo Calderón, Sheila Callaghan, David Henry Hwang, Julián Mesri, Sam Shepard, Ryann Weir, and August Wilson, among others. Sarah's work as a director/deviser includes IN THE FOG (BAX, Dixon Place, Prelude) and the upcoming PIVOTAL (site-specific). She is a member of the Lincoln Center Directors Lab.